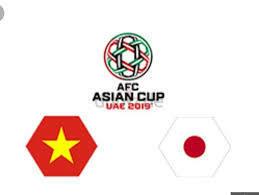 January 24 – Japan will take on Vietnam in the first of the 2019 Asian Cup quarter finals today at Al Maktoum Stadium in Dubai. Japan stunned Saudi Arabia with 1-0 victory in Round 16 encounter while Vietnam progressed to the quarter final following extra time and a penalty shot-out against Jordan. Four times Asian Cup winners Japan are appearing in the quarter final for the 7th time, and Asian Cup record alongside South Korea and Iran. Vietnam have reached the QF round once, back in 2007 when they lost 2-0 to eventual champions Iraq. Japan and Vietnam will face-off in the AFC Asian Cup for the second time. The group stage encounter in 2007 Asian Cup ended with 4-1 defeat to the co-host Vietnam. In fact, Japan and Vietnam met five5 times, but only twice in official competitions. Japan won 4-0 in a FIFA World Cup qualifier in 1973. Vietnam however, won 1-0 in their first encounter back in 1961, but Japan won the other two friendlies, 5-1 in 1963 and 1-0 in 2011. Japan have an eye on their 6th semi final while Vietnam are very much looking for a bigger role in the continental showpiece.